You have two main options when it comes to choosing a gas grill: natural gas or propane. Both types of gases have their own unique advantages, but propane grills are typically more convenient and easier to use than natural gas grills. They are easy to start, easy to clean, and heat food evenly. It also takes less time to cook using a propane grill, as these grills heat up to their final temperature very quickly–usually within fifteen minutes. Propane grills are a great choice for beginners and more advanced grills alike. They make outdoor grilling quick, clean, and easy, which in turn makes the whole cooking process much more enjoyable for everyone involved. If you’re in the market for a gas grill, consider a propane model to improve the quality of your grilled food and make outdoor cooking less stressful and more successful. This propane grill gives you the freedom to quickly and easily cook a meal for a large group of family and friends in your own backyard. You can cook up to eighteen burgers at a time on its expansive 405-square inch grilling area. This grilling area is crafted from porcelain-coated cooking grates. The grill’s steel lid and firebox are also coated with porcelain for maximum durability and weather resistance. Its four stainless steel inline burners provide continuous heat that cooks food evenly and locks in intense flavors. Ignite the burners and start cooking instantly with the grill’s easy push-button ignition system. Two metal side shelves are built into this grill. These durable shelves allow you to prepare your food and transfer it directly to the grilling area as well as store your grilling tools nearby while you cook. It also features a swing-away, durable porcelain-coated warming rack that offers 190 square inches of space to keep your finished food warm while you continue grilling until you’re ready to serve. Designed for tabletop use, this ultra-portable grill is simple, compact, and super convenient for outdoor cooking in your backyard or on the go while camping. Although it only features one burner, this high-performance stainless steel burner emits 8,500 BTU per hour and evenly heats a grilling area of 189 squares inches. This expansive grilling area is made from cast iron cooking grates that are enameled with porcelain for durability and even heating. You can start it instantly with its easy-start ignition and control its temperature easily with its simple burner valve settings. In addition to expertly grilling your food, this portable grill adds pizazz to your backyard as well with its stylish compact design and wide range of color choices. It is available in many different bright colors, including red, blue, green, orange, purple, and the shade of fuchsia pictured above. If you’re not looking to add a pop of color to your outdoor grilling station, you can buy this grill in a black or silver option instead. 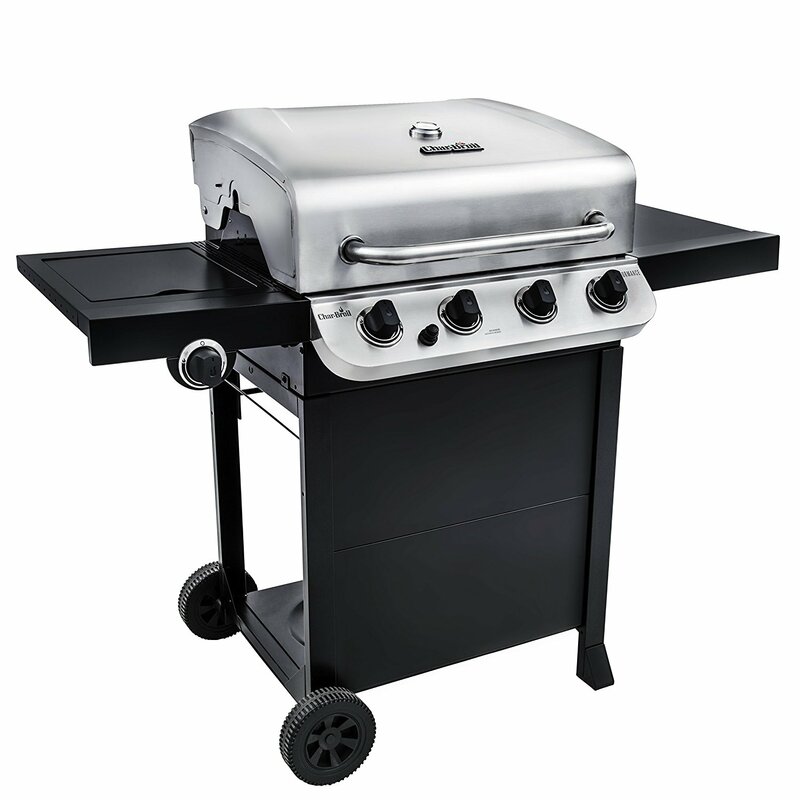 This propane grill features two stainless steel tube burners that heat your food evenly and continuously over 380 square inches of grilling space. Crafted from porcelain-enameled cast iron, this grilling space is reversible to provide the optimal environment for grilling both delicate food–like fish–and heavier meats. Flavorizer bars enameled with porcelain lock intense flavors into the food you cook. 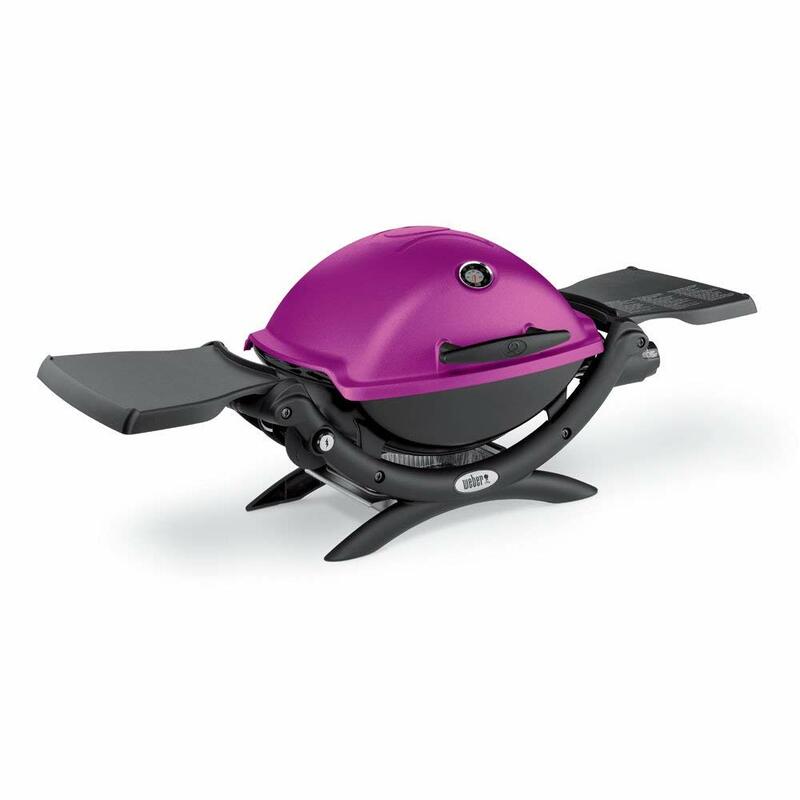 The grill is guaranteed to start effortlessly every time with its infinity ignition system. Monitor the temperature of the grill and its fuel levels using its built-in Bluetooth thermometer that links with an app on your smartphone or other device. When you’re done cooking but not quite ready to serve, just place your grilled food on the built-in 114-square inch overhead warming rack to maintain its temperature as long as you need. Clean up quickly with the grill’s grease management system that makes grease removal as easy as disposing a catch pan and replacing a drip tray. When you cook on this grill, everything you need is always within reach. You don’t have to run back and forth from the kitchen and garage and back to prep your food and gather your essential grilling accessories. Instead, just use the grill’s built-in stainless steel side shelves to prepare your food and hang your accessories on its built-in storage hooks. 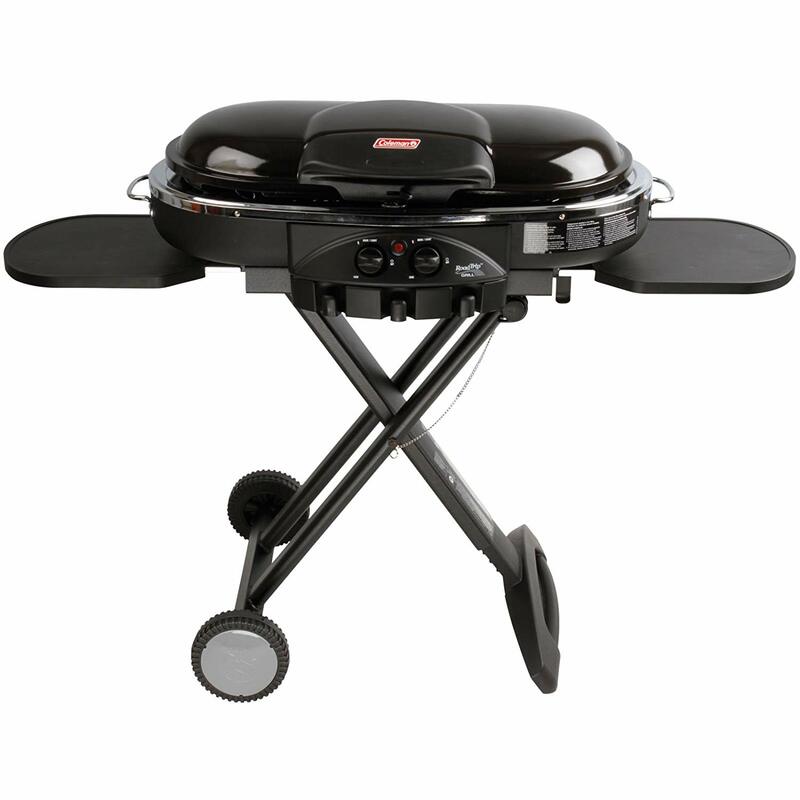 Plus, the grill itself includes attached wheels for easy portability and storage. 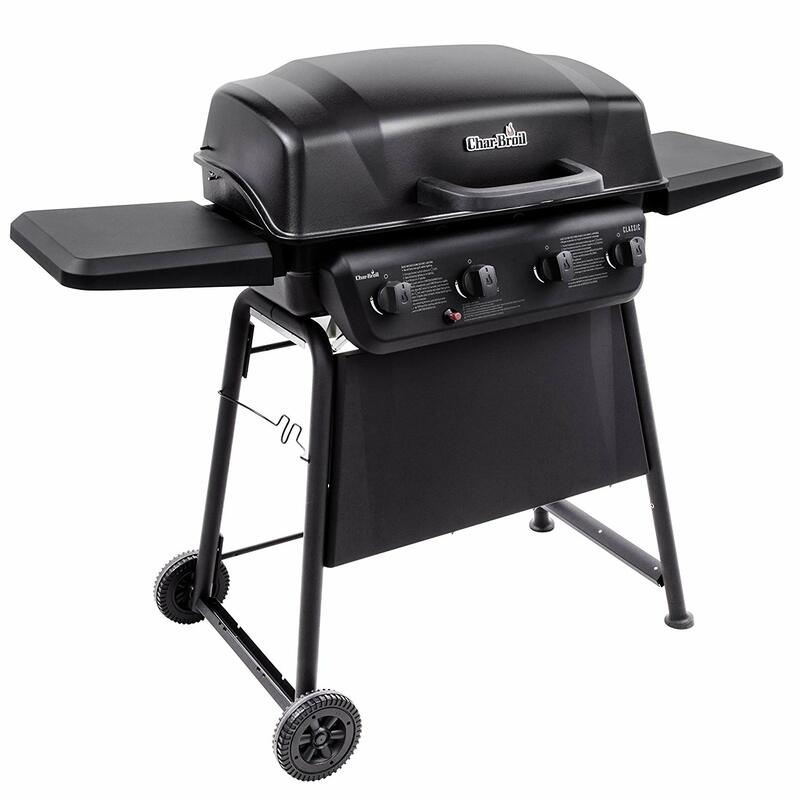 Featuring two separate grilling spaces–a 475-square inch primary grilling space and a 175-square inch secondary grilling space on a swing-away rack–this propane grill boasts a total grilling area of 650 square inches. Both of its grilling spaces are made from cast iron cooking grates enameled with porcelain for maximum durability and even cooking. 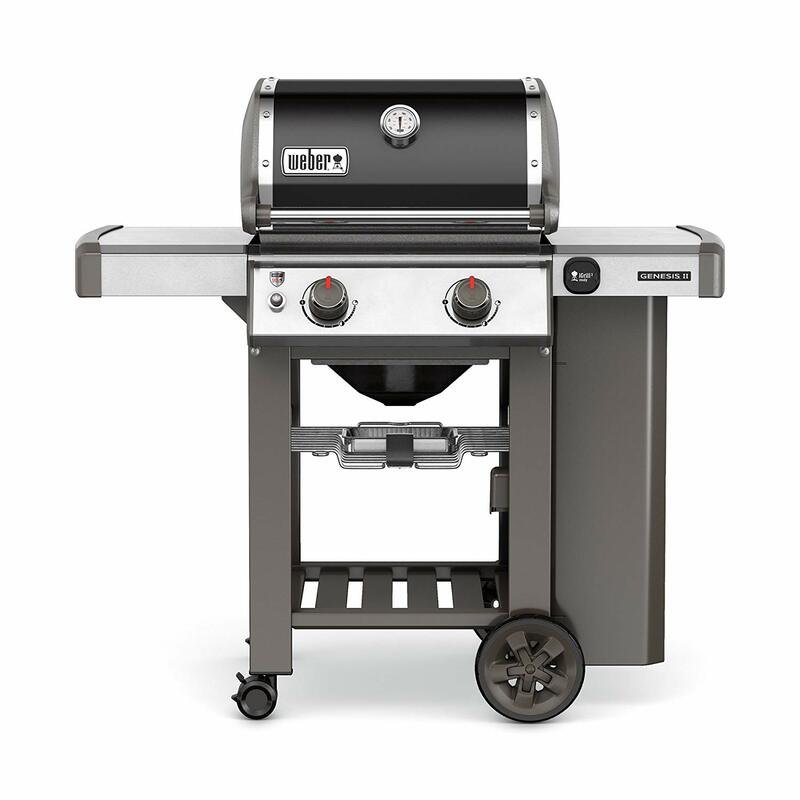 Its electronic ignition starts reliably every time you want to light the grill, and its lid-mounted temperature gauge allows you to continuously monitor the grill’s temperature for superior heat control and even cooking. Cleaning this grill after cooking is easy with its removable grease pan. Prepping your food and storing your grilling accessories right by your side is easy with this grill’s built-in expansive metal side shelves. These shelves–along with the rest of the grill’s stainless steel frame–are also easy to clean. When you need to clean the grill’s frame, all you have to do is wipe its surfaces with a wet cloth. Take this portable grill with you for easy, high-performance outdoor cooking at your next picnic, tailgate, or camping trip. Or, store it in your own backyard, where its compact frame won’t take up too much space on a small deck or patio. The grill’s collapsible design makes it easy to fit its frame into most car trunks for maximum portability. This grill features an expansive grilling area that measures 285 square inches. It is crafted from porcelain-enameled cast iron that is durable, weather-resistant, and easy to clean. Its removable grease tray makes internal cleaning quick and easy, too. Ignite the grill and start cooking immediately with just one touch using its Instastart ignition button. For added style, it is available in multiple colors: black, blue, green, red, orange, silver, purple, and maroon. 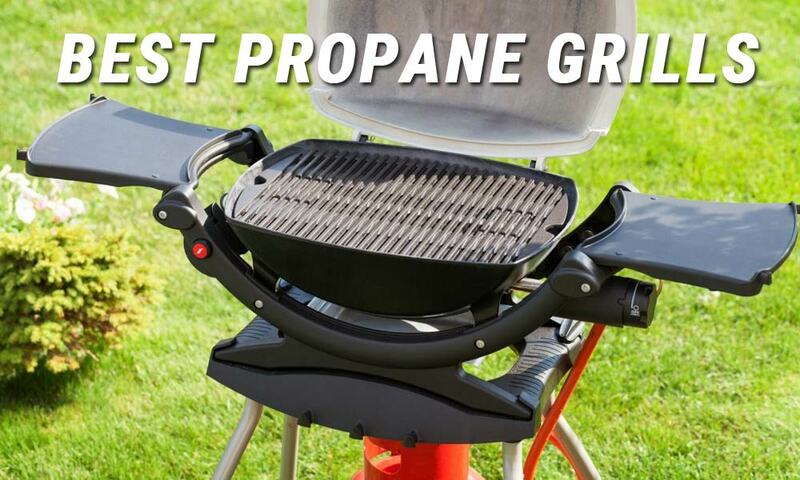 Having a propane grill in your backyard makes your grilling experience easier, faster, and more convenient all around. If you’re tired of waiting for your grill to heat up or struggling to grill your food evenly, check out these five top-rated propane grills to streamline your grilling process for delicious, evenly-cooked food every time.